We created this sweet little shadowbox gift for one of our favorite friends who loves birds and nature. 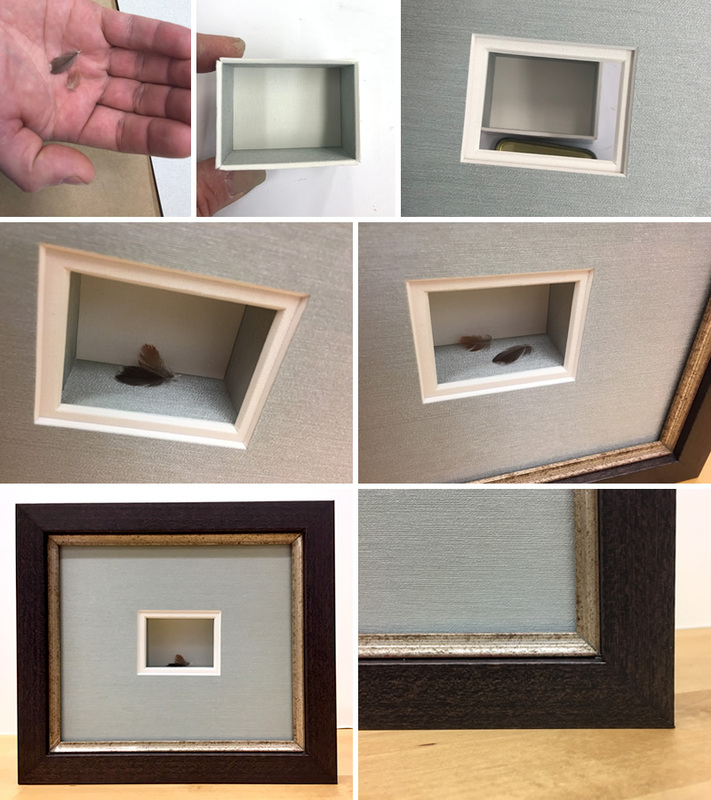 Two adorable little feathers left loose in a tiny shadowbox for an ever-changing display. They're rumored to be hummingbird feathers (but we're not totally sure). 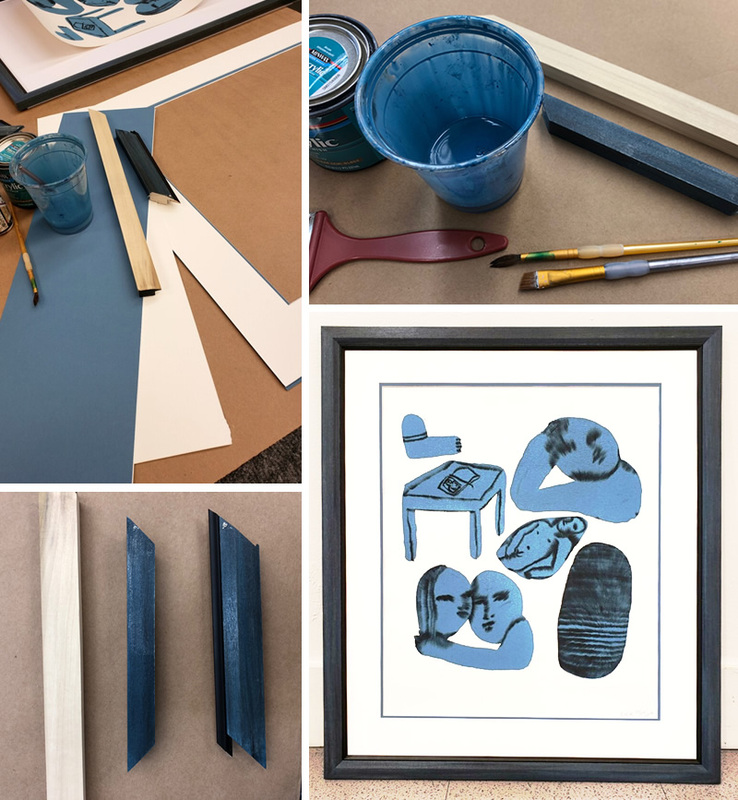 The 1x2" box was made with a pretty pale blue silk mat, and completes with a stained poplar frame. We love the challenge of finding unique and creative ways to display your favorite things. This month's project features a new service we are slowly introducing here at H&F... custom color stains and finishes! A customer brought in a beautiful print by local artist Emma Kohlmann. We searched for the perfect color frame, but no good match existed so Dan mixed up a custom color from scratch. We added a black fillet to further customize the project and the finished result is a one-of-a kind frame for this unique artwork. p.s. see more of Emma Kohlmann's artwork at the Taber Gallery at Holyoke Community College in November. 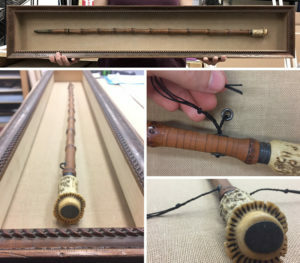 September 2018: President Garfield's Cane? 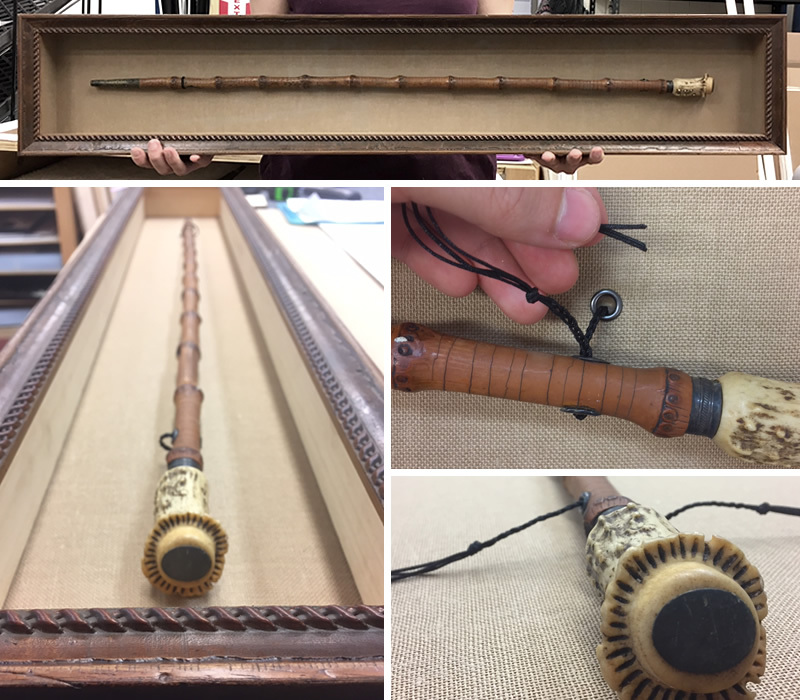 This lovely old bamboo cane is rumored to have belonged to President James A. Garfield. While there's no clear provenance, the family story is that a relative was a neighbor of the 20th President. Bamboo canes were all the rage in the late 19th century - this one features an antler handle and brass tip. We attached some gunmetal grommets to a linen mat so the cane could be attached with ties ensuring it can be easily removed in future. A shadowbox frame with a vintage look completes this special piece. Prez trivia: Garfield was the second president to be assassinated, and he served the second shortest term in office -- only 199 days until his death in 1881. Another fantastically fascinating shadowbox project came in this past month! This is a 19th-century Kiowa hair pipe breastplate. 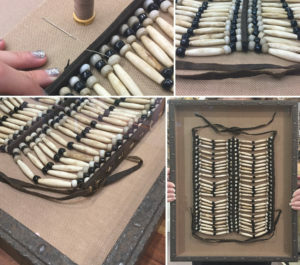 The long white beads are hand-carved bone and known as "hair pipes" - there are 100, which are strung with sinew, along with smaller pony beads, to a leather harness. Breastplates were purportedly worn as protection against arrows and spears in battle, and provided spiritual protection to the wearer. We carefully stitched the breastplate to a cloth board, arranged the leather ties to add a little drama, and completed the piece with a textured frame that compliments the repeating pattern of the beads. The customers were very pleased and excited to find the perfect spot in their home for this beautiful piece of history. 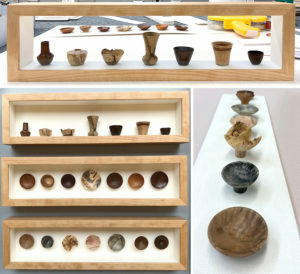 We recently were challenged to design a way to display twenty-one tiny handmade wood vessels -- each one measures just under 2"! We split them into three groups, and ordered three custom-made shadowbox frames from our friends at Boston Frameworks. We attached them to linen-wrapped mats, created a shadowbox shelf, and hoped the customer never came to pick them up so that we could keep them... Just kidding, we loved seeing the excitement on the customer's face when she picked them up! These delightful sparkly plaster masks were made by three kids for their mom for Mother's Day - the masks are molds of their faces! 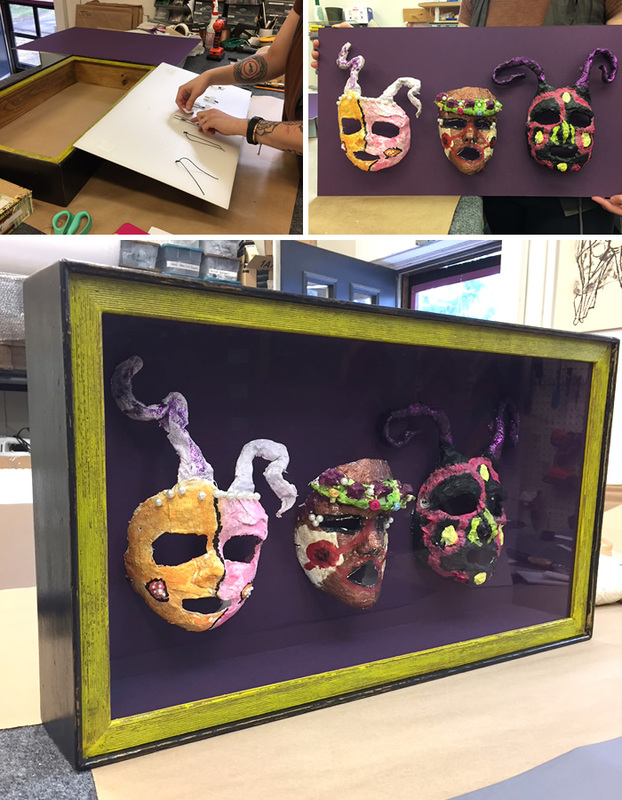 We ordered a colorful custom hand-made shadowbox frame from Chester Frame Company, and carefully attached the masks to a purple mat and sturdy coroplast, to display and preserve this wonderful memory. May 2018: Fabric Framing is our Favorite! An ornate colorful fabric piece was brought back from time abroad in China. Fabrics are one of our favorite things to frame! The antique hand-embroidered piece was carefully pinned to an archival board. 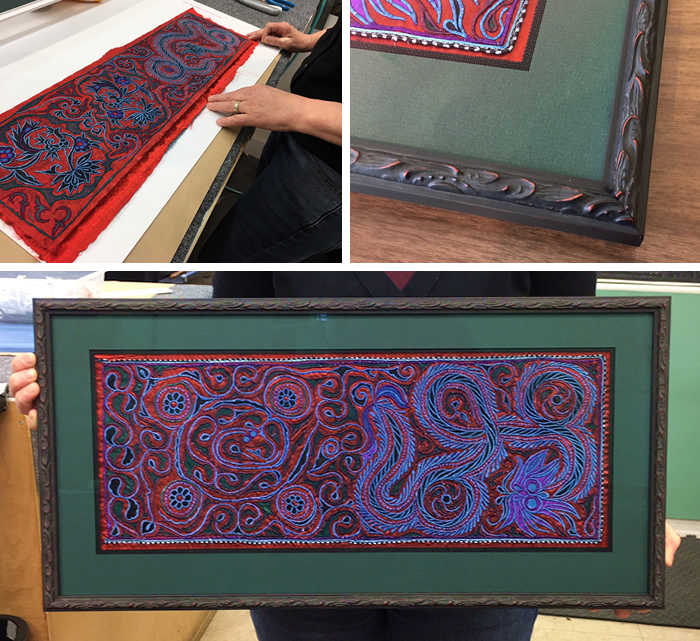 Two archival mats were chosen to contrast with the dragon's intense reds and rich purples; it was double-matted with a deep black linen and spruce green. An ornate carved black frame with red undertones completed the piece -- the curved lines in the frame echo the movement in the composition. 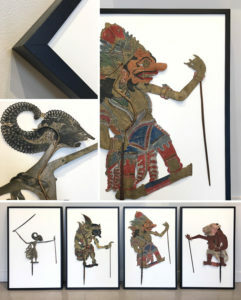 These are vintage Javanese "wayang" shadow puppets, used in traditional shadow puppet theater. The puppets typically represent figures from Hindu mythology and local legend. Our customer wanted a clean gallery look so we stitched each puppet to white mat board and installed then into solid walnut frames. We're sad to see them go, we loved having them in the shop. 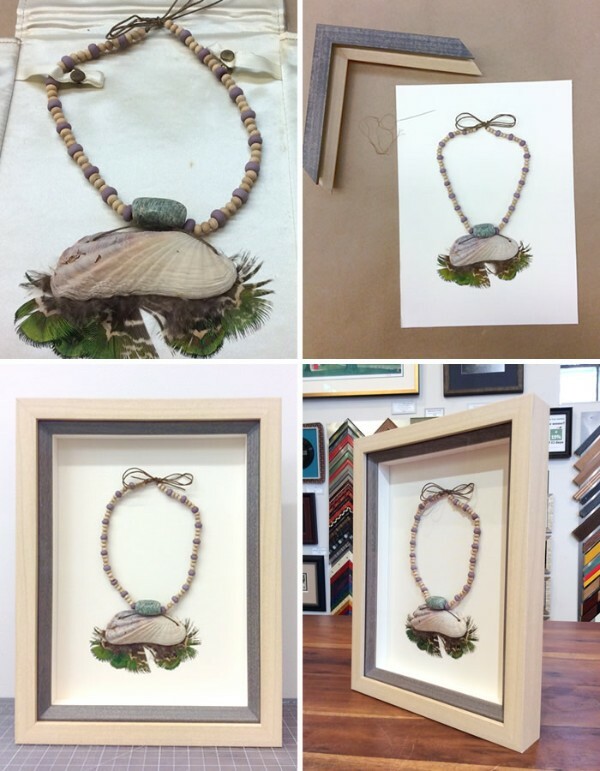 This month we had the challenge of framing this seashell and feather beaded necklace. Our customer wanted to strike a framing balance with this very unique piece of jewelry. Careful not to "over" frame this not-so-subtle piece, we stacked two frames together, both poplar wood with soft stains. We carefully stitched the necklace to a cream linen mat, and finished it off with museum glass for maximum clear viewing of this unique piece. 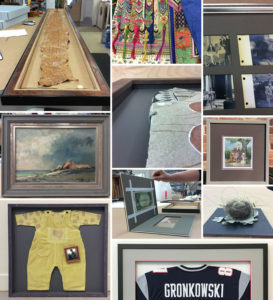 This month's featured framing project features multiple services we offer here at Hope & Feathers. This beautiful drawing was created by artist Ryan Jacque as a commission. 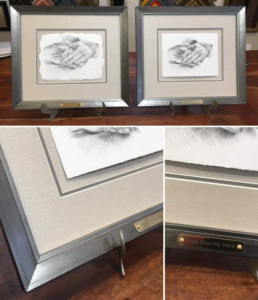 Our customer wanted to make seven framed reproductions of Ryan's original piece to give as gifts. Our printer Melissa scanned the original piece andprinted it on Hahnemuhle Fine Art paper. She then carefully deckled the edges of the paper to mimic the soft effect the artist had created on the original. For framing, we selected a combination of silk matting and a silver-toned frame to compliment this detailed pencil drawing. Custom engraved plaques were added to complete the pieces. 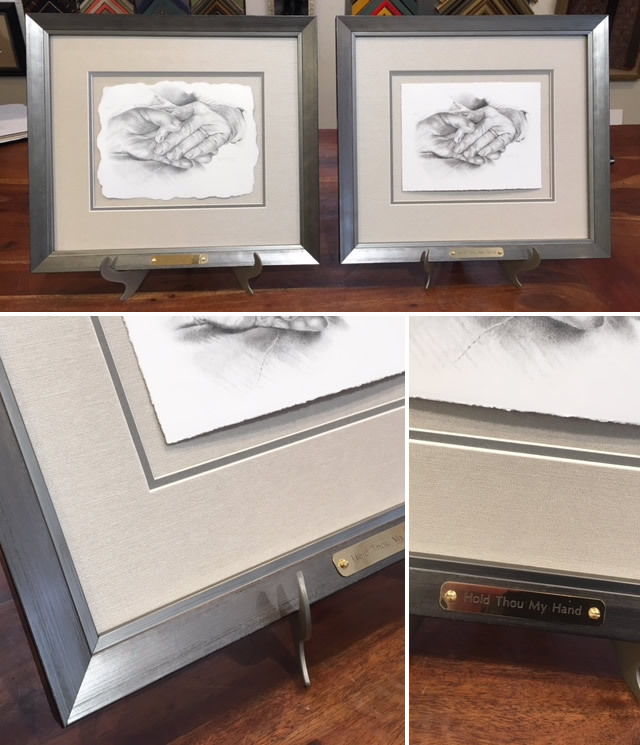 This project splendidly combined our custom framing and fine art printing services -- and we can add engraved plaques to any order. January 2018: Framing Projects of the Year! 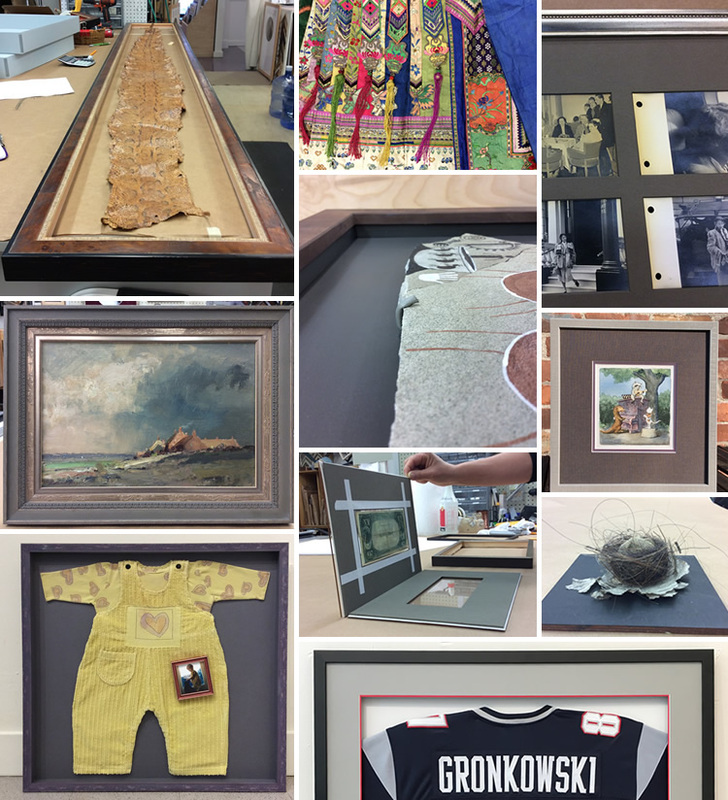 Check out some of the amazing framing projects we've done over the past year!